But I thought more was better? Not exactly a ringing endorsement for more being better! No, I am not messing with a classic. Daryl Conner's Commitment Curve is a classic! It was the most progressive model on commitment to change in 35 years after Lewin's journal article on the 3-stages. Daryl was very intentional about the term he used ... SUPPORT. Daryl is a practitioner. 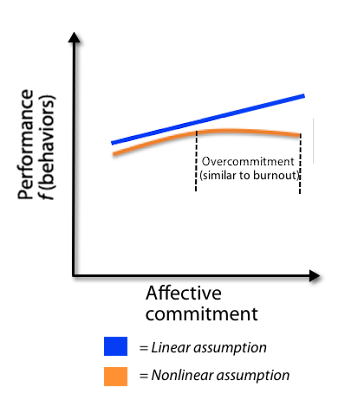 Since the publication of this model in 1982, scholarly researchers have been trying to test out theories of workplace commitment. The results have not exactly been spectacular. More affective commitment is better. Published in the first part of 2013, a group of Australian researchers found that more affective commitment is NOT better. They found that affective commitment (i.e. desire for a change) has a ceiling. Well, this means that scholarly researchers are finally finding ways to show that human behavior is not linear. 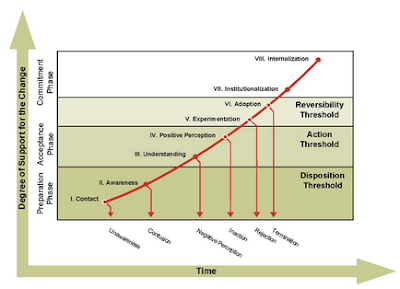 While you may think that is an obvious assumption, it is this linear mindset that drives change management failure. 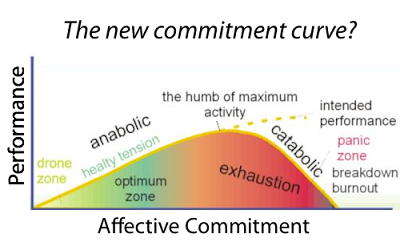 Dr. Coetsee makes the case that too much commitment, what he calls overcommitment, leads to resistance. I must confess that I really didn't "get it" when he first sent this model to me last year. The Morin article must have jarred the rocks in my head loose and I now see that Coetsee's view on resistance-commitment is how many view the performance-stress relationship. I'll be honest ... I'm not exactly sure where to go with all this. But I do know one thing for sure: the "more is better" mentality underlies change management failure. It is linear thinking in disguise. One size fits all doesn't work for organizational change. And yet, that fact hasn't stopped many of us to continue creating new one size fits all change management methods. How do you strike the balance between the swiftness of one size fits all and the adaptability of accommodating for individual differences?